I must say this is by far my favorite rendering. I can once again take my soul and travel through the Galaxy. I have reuploaded the triple-split file Zip. Please let me know if you are still having trouble with it! This last Aug. 14 I turned 66 and acknowledge the work you're doing as a favored ongoing gift. My imagination searches for some way to leverage what's considered real into what's possible. Your art consistently draws a bridge for my spirit to step from the confines of concept into unexpected invitation. Thanks, I pray you good health and continued success. that highland Mural is amazing! i've been looking for a frame for my bedroom! would be awesome on my bed room behind my bed! The link to the 2560 x 1440 v.1. is now working properly. Thanks for the heads up! The 2560 x 1440 (HDTV) version of lastthroes1 and lastthroes2 both lead to the same image in the Picklejar. I've been watching the progress of this piece of art from the very start, and after 3 versions you truly nailed it Ryan! This is fantastic man! I'm a big a sci-fi fan, especially of Alastair Reynolds, and this particular wallpaper reminds me of his "dark science fiction" worlds! Beautiful madness! Cheers! This is my favorite kind of your work, Ryan, and I love that I have three choices (I've been alternating). But I think my first choice is Last Throes 2 because of the clean look, although I do understand the viewpoint of the folks who think the planet juts too far into the colorful aura. Versions 1 and 3 are both fine work and the dust may be realistic, but IMHO it's not as aesthetic as it might be otherwise. Oh, another heads up: 2560x1440 (HDTV) of Last Throes1 is missing; 2560x1440 (HDTV) of Last Throes1 has the image of 2560x1440 (HDTV) of Last Throes2 in its place. Just awesome, I really enjoy the dual screen version of this. I love these type of renders. Great job on the latest version! It definitely looks much better without the dust. This image is perfect for my "Midnight" time period. I always wonder at people rating images like this (or really, any of your work) at a 3/10, 5/10, 1/10 are just doing so to mess with the ratings, are blind, are retarded, or very well are just pessimistic jerks. I just don't get it, nothing in your gallery should be rated below a 5, including your old work...whatever, I just want to see your good work be recognized for what it really is. Trust an astrophysicist to spot the "space anomaly". I've updated the files (again). I just set this as my desktop wallpaper on my duel screen and it looks flippin awesome! I very much enjoy what you've done with this one! Nice to view planets from a perspective NOT in an orbit around a star. The star's corona's appear north-south while the orbs are east-west. Nice. What I like about the third version is the way the eye is drawn around the nebula, without a planet shoved in my face to disrupt the flow. I would say that the "Dusty Iris" nebula photo you posted was the initial inspiration for this one (along with watching "Wonders of the Universe" on Discovery). The version for multiple monitors is rendering now! I love the latest version. I can think of several intergalactic photos that this resembles and as such it has the feel of being in one of those solar systems. The reality of the Universe is always surprising. I'm personally not a fan of the dust still, in my opinion there seems to be a disjoint between it and the rest of the scene. I do however love version 2, it is quite close to what I wished for earlier. Sadly I feel that the images best characteristic, its vast uncluttered scale, has been lost completely by the growth of the ringed planet. Therefore I would love if there could be either a dustless version of vers. 3 or a large planet-less version of vers. 2. Perhaps it is my own more minimalistic viewpoint coming up at odds but I feel (as you have had the programs and computing horsepower to express those scenes previously impossible) that your images are becoming overly "busy". For example 'Dødenfell' has a complex mountain scape, lightning, multiple layers and colours of clouds, an eruption and a very densely star filled sky. I would maintain that your best images are those that have only one main focus with a near uninterrupted view of it (in the space genre see 'Hidden Forces' and 'Crucible Planet') and that the number of such images has dropped. I'll take two examples: my favourite images are still 'Dispersion' and 'Highland Spring'. Both these have the possibility of adding more, such as more chemical equipment or fires and flocks of birds but their cleanness is what will always attract me to them (say over the rest of the Highland series). I hope from this rambling "critique" you might be able to take away a feeling that certainly some of us believe in the "less is more" belief. I want to say I am always glad when another piece arrives, thank you. I think I like version 3 best--but on all of them the colors just seem kind of... putrid? Maybe it's just me, but I'm kind of turned off by it. Otherwise, it's a really interesting image. After having version 3 on desktop all day, ive gotta say its sticking with me. Its crisp and defined with plenty of action going on. I think this one will stay for a while. Thanks Ryan. I like the v3 version. It gives a sense of the solar system being blown away. Awesome! I've re-uploaded the hi-res files and these should fix the "line" issue. I'm still not sure what caused that! I have been a member here for at least 7 years and I have to say this is not a good picture. I don't like any of the versions. Just my opinion. Thanks for the heads up. Actually that link is supposed to bring up a directory listing (and moving up will allow you to browse the directory structure of the Pickle Jar). There isn't a security issue because only Members can browse the PJ. Clicking on "all resolutions" is getting me FTP listings, and I can navigate up to your picklejar folder on your web server. probably not a good thing security-wise. If I may be so presumptuous, now might be a good time for your long-posted wisdom from Leonardo, "Art is never completed, only abandoned." this is so much better than the first two, you perfected it. Great job Ryan. Version 3 is OK, but the dark dust in the bottom left corner looks as if it had been photographed while turning the camera! These blurry and perfectly parallel edges are not my taste. The 2nd and 3rd version are really nice, but i definately prefer the original. The dust is more realistic and the small foreground planet provides some scale for the size of the nebula. Liking Version 1 & 3. I didn't like the pov of V2. I really liked V1 on my smartphone, but agreed with others that larger sizes didn't have enough color and seemed "dull". Version 3 has more color and better "action". Not sure how I feel about the new dust method. Still seems like it needs work, but I like the overall look to Version 3. Love your space scenes. I love how the dust in the foreground looks like it's about to fly out of the screen. The smaller planet is much better too. But that blasted line is still in the lower right corner! It bugs me. Ringed planets are quite common actually. The rings usually aren't like Saturn's though. More like Jupiter and Uranus where you don't really see the rings until you get close. This is a huge improvement! The added contrast and color are great. I still think it looks too much like regular clouds but they are no longer distracting and I especially like the ones in the upper left that are lighter. This one gets my vote. I am definitely liking the third one the most so far. The position of the elements, including the dust, work for me. I think the dust on the third one is better; it's the best version of the three. I worked a bit more on my Vue d'Esprit "space dust" process today and I've posted a third version of "The Last Throes" this afternoon. I feel a lot better about this one than the first version. Hope you like it! I like the 2nd one so far due to the arrangement of the planet and the nebula. The planet looks better coming into view from the left side. I really like the "solar" flair rings around the nebula. Stars above left of the planet may be too dense, but still one of my favs in recent history. Keep up the awesome work! Shrink the ringed planet by about 1/3, add in your new dust and I think you'll have another winner in my book. Ryan, the rings seem a bit off. Portions of them should be illuminated. This is another chance to get some more color in the image. I know you're not trying to take away too much from the star and the dust. Thanks for all the great feedback! I've been working in Vue this morning to improve my space dust. The next version should be clearer (like the second version) but the dust lanes should look much better. Ultimately I think I prefer the first version. They're both great though as my favorites are always planetscapes, so I'll happily take two. More please! I dont mind the dust so much. The environment seems more believable but it wouldnt hurt to cut back a little. The smaller planet and other mooms appeal much more than the large circle in the other one. Maybe a bit more attention to the planet for some highlights or color could help spruce it up. Over all prefer the first. I prefer the first version as well. The huge planet in the second is too ehhh flat and big. Admittedly, I was in the camp that liked the dust, but I prefer the first one but largely because the planets were smaller and thus more balanced with the stellar formation/anomaly. In the second version, the foreground planet is too large for my liking, which is mostly relevant because the planet is largely dark, so it just ends up being a dark patch on an otherwise interesting starfield. I agree with RC, the perspective on the first one is perfect, the 2nd is more the norm and i like the extra color in the planet. Both images are great in their own right. I really like the perspective in the first version, which shows the planet and its moons from a distance. The dust is clunky, but I think it would work if it was either more diaphanous or more opaque and distributed more linearly about the image as opposed to the clumps. Space isn't perfect by any means. The dust in the first one made it seem more gritty and real, to me. Either way, both are great. Your space scenes are always phenomenal. Is there a second light source? The terminator (line between light and dark) on the largest foreground planet doesn't look right. It looks like it's caused by two light sources but we only see one. The second version is much better in my opinion. True it is much more 'ordinary', but I found that the first one really just wasn't something I would want on my computer. Like someone else said it just kept making me want to clean it off. I definitely prefer the version with dust. It was one of the more interesting aspects of the first picture for me. I also prefer the way the planet was positioned in the pickle jar version. This one is too up close and feels a bit off for some reason to me. I wish I could figure out why exactly it bugs me. Maybe since it's so much closer to the foreground of the picture, it feels as though it needs more detail that is lacking, whereas the distance the planet is in the first rendition didn't need as much. Personally, I think the first version with the dust was better. But thats just me. Both version are great. All good man, keep up the good work! There is no end to creativity (and you've got lots of it). Continue! Here's a second, more "conventional" version of "The Last Throes", without the "dust experimentation" that some thought muddied the scene. The original version will staying the Pickle Jar. Which do you prefer? I was all set to jump on the band wagon for the add a little interest/color point of view. Then I viewed it at the full screen resolution and the difference is amazing. The greys of the background between the stars become closer to a navy blue and the speckles of the stars go from being more or less a uniform white to varied with other single stars of different hues. Good Job Ryan Glad I took a closer look! This one could use a little color in the planets, but otherwise this is great. I love the overall idea (a dying star) - however, I think this image would look much better if there was less gray and more black. That would help bring out the star and the planets. Ryan, I LOVE this new image. "experimental" and incredible in the depth, the layering, and the composition. In my opinion, this image is a success and I would love to see you play around with this layering technique more. Keep up the great work, this is one of my all time favorites. It is a different perspective from seeing the dark side of the planet. I am wondering whether you can add any light refraction in the space dust. I would love to see some more color, especially on the rings of the largest planet. The planets just look too muted. Adding some color will bring a little more life into the piece of art imo. Otherwise I love it! It's okay, but I have some issues with the composition, in that the only interesting, colorful thing going on is in one spot well off-center from the frame, drawing the eye to it. I think I agree with Spike below, that the colors for everything except the single star are pale and gray. Even the planets are all just silhouettes. In short, the only 'action' place in the picture is that one spot; everything else feels static. And I say this as someone who has loaded ChronoWall with nearly all of your dual-screen planetscapes. 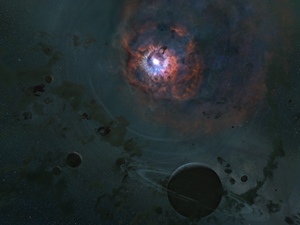 This image certainly pays homage to the older space art. Despite what others are saying. You should definitely do more stuff like this. Keep up what your doing. This one is awesome! I can't wait for the multiscreen! Overall, I think it's an interesting composition... though the colors are generally pale and sickly, in a sense. Perhaps less realistic, but ofttimes your stellar works are quite vivid and colorful, and I usually find them quite beautiful. From an artistic perspective, the prevalence of pale, wan colors in an image of a dying star feels appropriate - though it doesn't make me want to set this image as a wallpaper, either. The dust isn't clumpy enough to be realistic. It looks too smokey which isn't how dust behaves in space. And the foreground dust looks too much like ink in water, again, not how dust behaves in space. Reminds me of your old "Iris Nebula" image, which is one of my all-time favorites. Only criticism might be the ring planet draws too much attention. Maybe make it about half the size and take off the rings? I think that this has some interesting prospects, however (and its a huge however) I don't feel this works. The "dust" looks like huge smudges on the screen, they appear to have lost all depth both within themselves and with respect to the scene. You can mostly only tell where they are in space when there is something directly in front of them and then this can leave the object (top left planet) with a "cut out and stuck back on" feel. I would love a version with out any dust at all. I think the effects on the sun and the rest of the planet scene are brilliant. If the star-y background was clean it would give an amazing sense of loneliness to this one system 'as it collapse into itself all alone in the vastness'. Ryan - I think this looks great. It is cool to see this new work of yours this morning as I just visited a planetarium yesterday. I like the coloration of the dust radiating from the star. If I may - I think the planet in the foreground is a bit too large. Also what would you think of adding a brighter star or two in the background, or say, a small star cluster? Lovely image! Can't wait for tri-screen! this one just makes me want to clean my monitor screen. I always prefer the "in space" version of your planetscapes and this one is no exception. If you get chance, I'd love a dual-screen version. This dying star or whatever looks great! Maybe you could make it a bit larger so that the dust doesn't dominate the scene too much. After all, I would accept this as a real new wallpaper, not just "experimental". I'm good with everything but the foreground layer. It looks too much like regular clouds and just detracts from the whole. The focal point, the "phenomena", is diminished and it lacks harmony. I just want to get that out of my way. Maybe more translucent or loose particulate matter would be better? Great piece otherwise and thanks for letting us share in your experiments! A dying star... indeed, a dying solar system. Chances are any life has long since vanished from the star's time as a red giant. The lifeless effect comes through. I like it a lot. Well, people want shiny pictures for wallpaper, though, right? Hmmm. 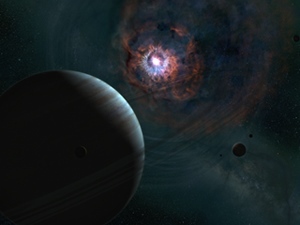 Could waves of stellar matter be ripping at planets, smearing the largest one's rings? Maybe it's pre-nova, collapsing, and though not necessarily true to physics, it starts pulling in its planetary children? I'm assuming that is suppose to be a white dwarf? I've worked in a planetarium for quite some time, and am a huge astronomy fan (one of the reasons I love your work so much!) This is very realistic, and one of my favorites. Keep it up, Ryan! It kinda looks like a giant cosmic eye, but I really like this image. I think the areas around the edges where the stars show the brightest should be clearer from dust to add contrast. It does lack a little in color also. Other than that it looks great. this has way to much grey in it. Just not up to par with your usual work. LastPass does still work. I log into the site all the time with it (including this time). As far as The Last Throes goes, seems like the dust should "sparkle" more. I think the surrounding planets could use a little color as well. They look too much like silhouettes. AS a long time fan of both Ryan's work and the Astromony Picture of the Day Archive provided by NASA, I can safely say that is one of your most realistic space scenes ever! Why doesn't Lastpass work here anymore? I think Ted put his finger on it. It does look good, but more contrast with dustless space and colors would enhance it overall. I like it, as a start, but it looks rather 2-dimensional. Experiment or not, I couldn't be happier to see you working on what I believe to be your strongest suit - planetscapes! Those and abstracts are why I joined, and why I will continue to come back. Do me proud Ryan! I think this one turned out quite well. You get the feeling of the close up dust from the planets and the distant dust, which is what I imagine you were going for. Compare with your other space scenes where regions of clarity shine through (Agni has red space dust but it does not cover the entire image). Must make some of the beauty of the singularity colors pierce the dust.